Shopping for Dark Shadows Model Kits? Vampire van from the sci-fi TV series Dark Shadows. This model kit includes a Barnabas Collins figure! Carry his coffin inside the van or on the included trailer. It's pure horror-themed automotive fun! 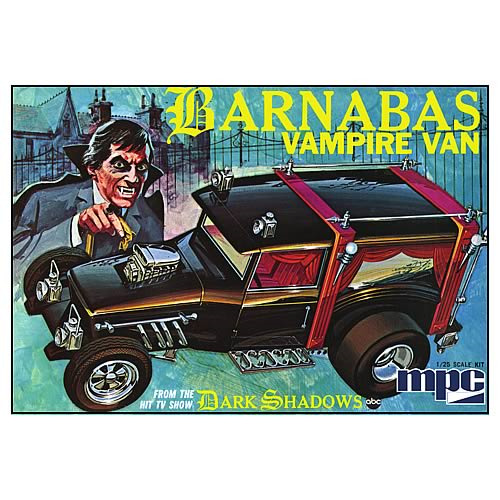 Barnabas Collins' Vampire Van Model Kit is from the cult-classic sci-fi TV show Dark Shadows. At 1:25 scale, it's pure horror-themed automotive fun, a classic hot-rod hearse that any blood sucker would be proud to drive! No macabre detail is left unattended, from the vintage coach lighting fixtures to the coffin-handle roof rails, and even a shovel-handle shifter. The in-scale figure of Barnabas included in the kit can be assured of secure, light-proof transportation with his upholstered wooden coffin. The casket can be carried either in the back of the van (accessed by the opening rear doors) or towed on the special included trailer. Nice ride, Barnabas! Skill level 3. Ages 12 and up.